The United States Congress designated the Oregon Badlands Wilderness (map) in 2009 and it now has a total of 29,182 acres. All of this wilderness is located in Oregon and is managed by the Bureau of Land Management. The Oregon Badlands Wilderness holds a number of remarkable and exciting landforms and geologic features. Most of the area includes the rugged Badlands volcano, which has features of inflated lava. Windblown volcanic ash and eroded lava make up the sandy, light-colored soil that covers the low and flat places in these fields of lava. Dry River, active during each of several ice ages, marks the southeast boundary between two volcanic areas – Badlands volcano and the Horse Ridge volcanoes. Earth movements along the Brothers Fault Zone have faulted and sliced up the old Horse Ridge volcanoes, but not Badlands volcano. The Badlands formed in an unusual way. The flow that supplied lava to the Badlands apparently developed a hole in the roof of its main lava tube. This hole became the source of lava that built a shield volcano that we call the Badlands (technically, a rootless shield volcano). An irregularly-shaped pit crater at the top of the shield marks the site where lava flowed in all directions to create the Badlands. It is located about 1,500 feet northeast of milepost 15 on Highway 20. Highway 20 traverses the shield along a straight, five-mile stretch between the intersections with an old section of Highway 20 (between mileposts 12.6 and 17.5). Soils in the Badlands were largely formed from ash associated with Mt. Mazama, now known as Crater Lake. A variety of wildlife species inhabit the area including yellow-bellied marmots, bobcat, mule deer, elk, and antelope. The southern portion of the Badlands Wilderness includes crucial winter range for mule deer. Avian species include prairie falcons and golden eagles. Planning to Visit the Oregon Badlands Wilderness? 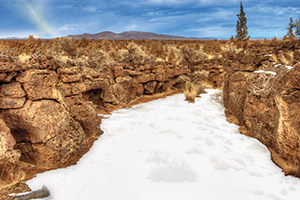 Visitors to the Oregon Badlands Wilderness can help in protecting this fragile desert ecosystem by adequately planning their trip and by arriving prepared. Knowledge of the area, weather, terrain, limitations of your body, and common sense can help to ensure a safe trip. Trail junctions are unsigned, so visitors should carry a map. Walk Abreast When Walking Cross-Country. When off-trail, single file traffic creates entrenched social trails which detract from the sense of solitude; the single passage of feet tends to heal more quickly in the wind. Stock animals are allowed only on designated trails. Dispose of Waste Properly. Pack out and do not burn or bury your trash. Do bury human waste 6 to 8 inches deep at least 200 feet (about 70 adult paces) from camp. Equestrians should pack home trailhead and staging area horse manure. Minimize Campfire Impacts. Burn only dead and downed wood no bigger than the diameter of your forearm. Do not limb trees - they are an essential part of the Badlands Wilderness experience. Protect Cultural Resources. Should you happen upon a pictograph or artifact, observe and enjoy it - in its place. Touching, marking, tracing, or otherwise disturbing can cause irreparable damage. Leave What You Find. Leave rocks, plants, artifacts, and what even appears to be old junk as you find them. Protect Natural Resources. Carving of trees, vandalism, and graffiti is illegal. Observe wildlife from a distance. Do not follow or approach them. Never feed animals. Feeding wildlife damages their health, alters natural behaviors, and exposes them to predators and other dangers. Control pets at all times. Personal Technology. Although useful in emergency situations, cellular phones, GPS receivers and other devices may impinge upon others’ wilderness experience. Be considerate of others as you use electronic devices in the wilderness.